The Excelvan 4K 16MP WiFi action sports camera is a good option for capturing the thrill of the extreme. With its 16MP and 4K 30fps resolution, you can have never-ending fun and endless memories to make and record. You're sure to get the perfect shot, whatever or whoever your subject is, with the camera's multimode function. Automatic presets for certain activities like diving, climbing, skating, biking, allow you to shoot with just a touch of a button - no more presetting required. It even has a setting for home security, making it a good security camera. The WiFi feature serves as connection between the HD DV and your mobile device. 30m waterproof, a solid shell to stand dirt, sand, water, etc. 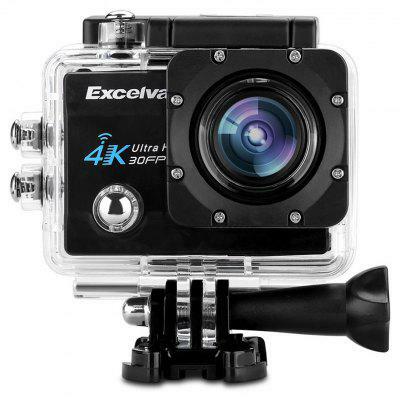 Want to be notified when the Excelvan Q8 4K 2 inch Display WiFi Action Camera gets even cheaper? Make sure you snag the best price by entering your email below. We'll email you when the price drops, free! We're tracking the price of the Excelvan Q8 4K 2 inch Display WiFi Action Camera every day so you know if that deal is really a steal! Check back for to check the best price for this product - and whether its current sale price is really the cheapest it's been! No Excelvan Q8 4K 2 inch Display WiFi Action Camera coupons found!